Game description: Lilie no Atelier: Salberg no Renkinjutsushi 3 is the third game to be released in the official Atelier series, and the final game in the Salburg trilogy. 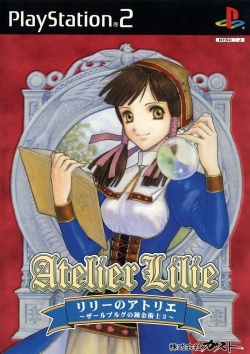 After arriving in Salburg, the game's main protagonist Lilie hopes to build an alchemy academy in the Kingdom. Alchemy is severely under developed in comparison to the Kingdom of El Baldor, which is home to many talented alchemists. Because Salburg has never seen the likes of alchemy, Lilie must prove to King Schigsal that the Kingdom would benefit from alchemy. Working through a small workshop in town, Lilie will enlist the help of two bright alchemy students from El Bador, Hermina and Ingrid, to help her work. Lilie's main goal is to gather any aide that she can so that the academy can be built. This page was last edited on 15 April 2019, at 11:14.